All indices were again testing resistance with small gains, but not enough to challenge a break of supply. 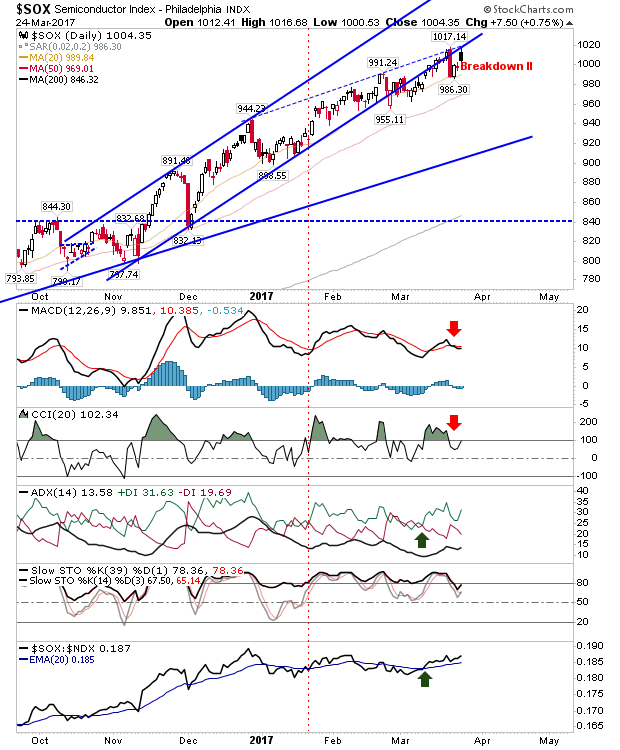 Shorts have been presented an avenue of opportunity in the Semiconductor Index with a bearish black candlestick at the convergence of the former rising channel, and the hashed blue line connecting the swing highs dating back to December. Technicals are a little scrappy, but there is still a MACD trigger 'sell' alongside a 'sell' trigger in CCI. The Nasdaq 100 also finished with a black candlestick (as well as a 'spinning top'), right on 20-day MA resistance. The higher volume does not represent accumulation, but is more in line with churning. The MACD has a well established 'sell' trigger, with On-Balance-Volume close to a 'sell' trigger. 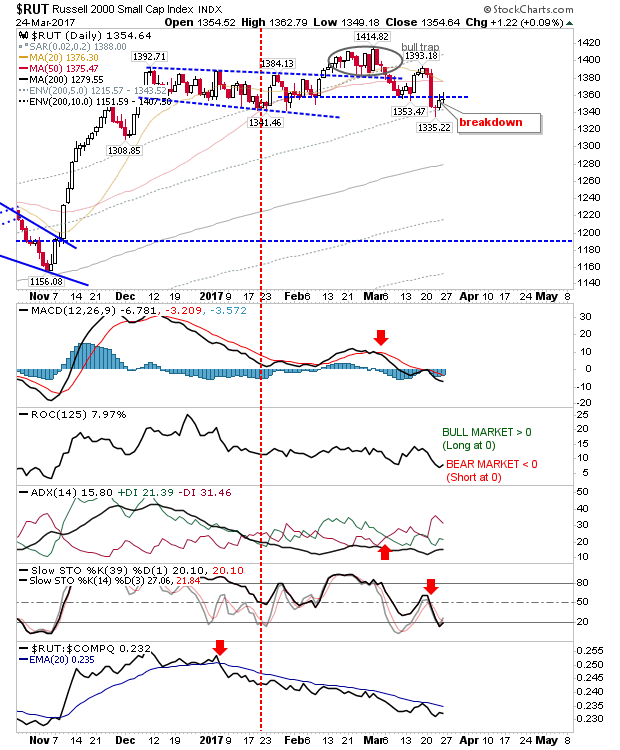 Another shorting opportunity can be found in the Russell 2000. Friday's gain showed a consecutive day with an upper spike finish; these spike highs mark supply at the earlier swing low from March and trading range lows of January/February. Aggressive shorts could take a punt here with a stop above 1,363. More cautious traders may want to wait for a test of the 20-day MA which lies just 20 points above Friday's close. Longs may want to take a look at the S&P. It finished slightly down on Friday, but it will soon be leaning on the 50-day MA. Volume was light, so there wasn't concerted effort to unload on Large Cap stocks. 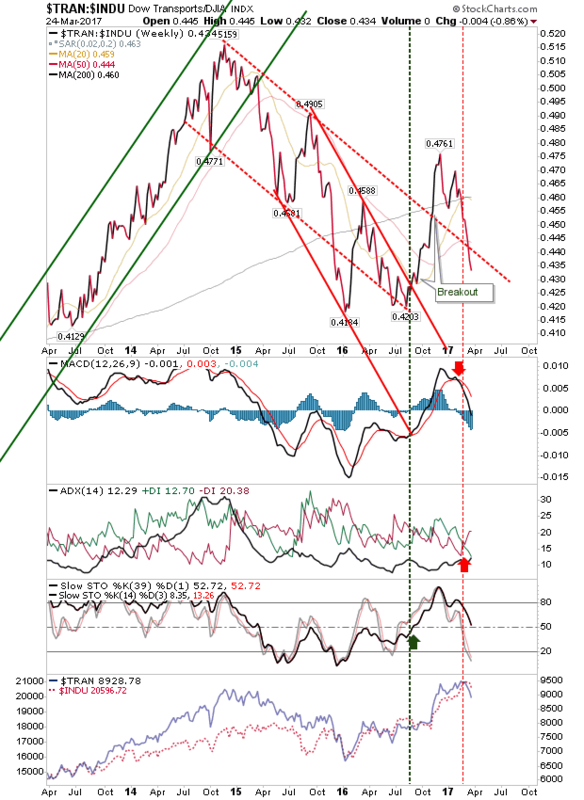 Technicals are weak, and if Slow Stochastics [39,1] was to drop below the bullish mid-line (50) it would mark a net bearish turn in technicals. In terms of worries, the relationship between Transports and the Dow Jones Industrial average is again under pressure; with oil prices weakening Transports should be reaping the benefits but this is not the case. As a bellwether for the economy the lack of participation in the Transport index suggests a cyclical turn in the economy, which is typically lead by weakness in the indices. 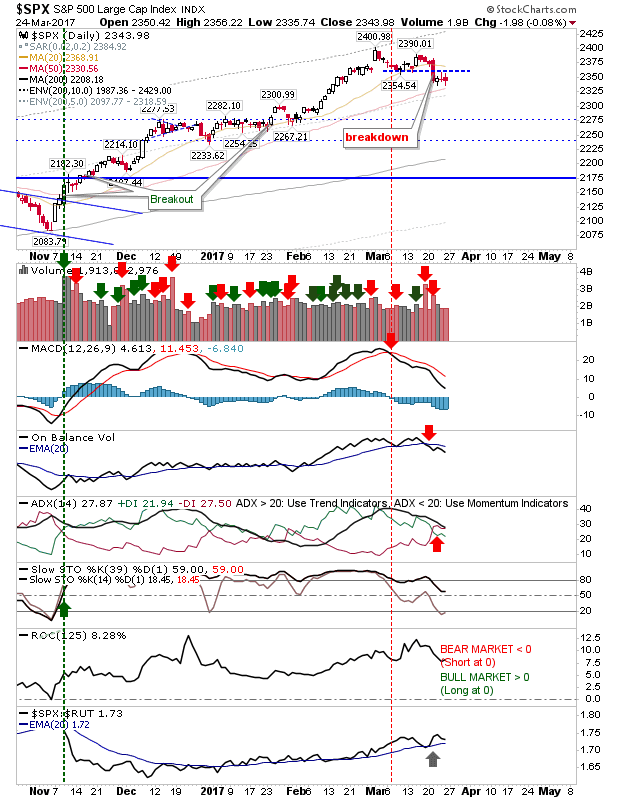 If this is the case, then early declines in indices are likely to continue. 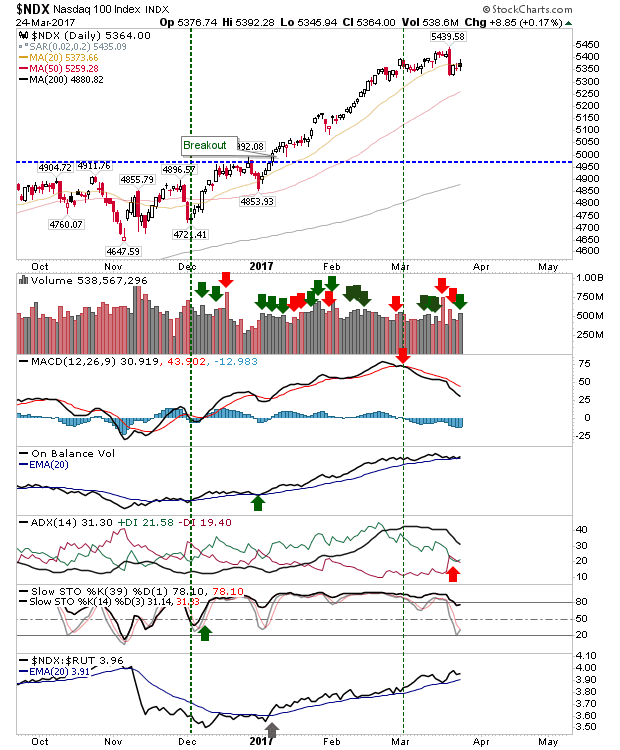 For Monday, look for shorting opportunities in Tech and Semiconductor Indices, but if there is a positive action pre-market, then the S&P could deliver some nice upside.